Latest News!! : The OPEN EYE supplement of the daily British newspaper "The Independent" (April 2nd 2002 issue) writes: "German graduate Tillmann Henssler was so enthusiastic about his studies with the Open University Business School that he created a detailed website for OU students based in Germany and continental Europe. Tillman, from Karlsruhe, studied for his OU MBA while living and working in Germany and his website, which is in German and English, is based on his experiences..."
Seine Erfahrungen als MBA-Student der britischen Fernuniversität Open University Business School (OUBS) hat Tillmann Henssler ins Netz gestellt. Hier findet sich - auf Deutsch - viel Nützliches über den sehr renommierten MBA-Studiengang." The student magazine AUDIMAX contains in its February/March 2002 issue (pages 8 and 9) a very interesting article with the title "Uni-www.-ersity.de - E-Learning ist in an deutschen Unis. Löst die Cyberuniversity das klassische Präsenzstudium ab?". This article mentions my my experiences with distance-learning at the Open University Business School. 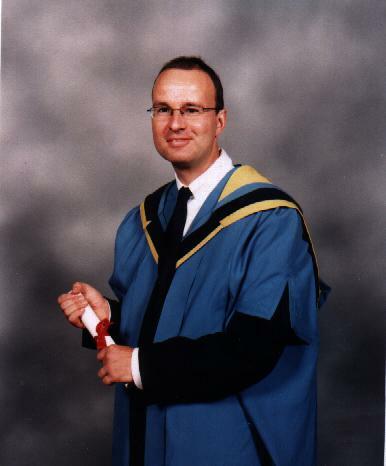 Many people have asked me about my experiences with the MBA course (from 1997-2000) at the Open University. So I had the idea to write about them from a Continental European German perspective. In the following sections you will find some tips and infos, that I personally consider to be useful. At that time I found it very difficult to find a suitable MBA Programme for myself in view of the masses of available information including glossy colour brochures and press releases about business schools. The Open University is one of the biggest providers of MBA-Programmes in Germany - there are currently over 500 students from this country enrolled in the programme. 1. International comparability and transparency of Anglo American university degrees - Bachelor and Master- and their fast growing acceptance are an alternative to the "Diplom". The Open University MBA has been conceived for working persons (in the middle or higher management). If you have already finished a first degree, you can complete the MBA within three years. 2. The excellent reputation worldwide of the Master of Business Administration degree in particular among large enterprises. An Open University MBA requirement is several years of professional experience and the programme is internationally oriented. People from all regions of the world study at the Open University. 3. In the Internet age, virtual courses and degrees are becoming ever more popular. Teaching materials can be recalled in the Internet or online and completed and updated. By means of the conferencing software "First Class" one can participate actively in discussion forums, with associate lecturers, professors and other students about the many different aspects of the management and course concepts. You can also complete administrative matters online (registering for courses, choosing residential schools, etc.). Compared with conventional study at universities where lectures take place at fixed times, with the Internet you can study the course contents at your own rate and time. You don't have to study at one fixed place; you can study the material at home, while commuting or on holiday. Besides that you can go back to the online conferences: there the discussions are written down and accessible for all students, thus the learning effect is much larger than with conventional courses. There are two ways to complete the Open University MBA. An interactive management development module, practicing key personal and interpersonal skills normally studied at a 2-day residential school. The Professional Diploma in Management (Stage I) develops the functional and general skills needed by experienced managers who want to advance their careers and extend their abilities to meet the latest developments in business practice. To achieve the Diploma, managers must already have attained the Professional Certificate in Management (or a recognized equivalent qualification). All elective courses (with exception of the Management Research Project, which takes one year) are 6-month courses. The ratio of compulsory to elective courses is 1:1. For questions or further information concerning study you can contact the Representatives of the Open University. Alternatively you can also fill in the Prospectus Request Form on the Open University Web Site. Students receive course guidance and support from Associate Lecturers. Associate Lecturers hold seminars, evaluate the Tutor Marked Assignments (written work) and provide course subject support for about 10-15 students. Depending upon number of students, seminars are held in various cities, e.g. Frankfurt, Stuttgart, Munich, Hamburg or Duesseldorf. You are assigned to a tutor group. My experience was that the seminars for "Foundations in Senior Management", "Strategy" and "Creativity, Change and Innovation" were held in Frankfurt , tutorials for "International Enterprise" in Stuttgart and tutorials for "Financial Strategy" in Duesseldorf. Alternatively you can click here for an overview of the dates for the forthcoming Open Events (Information Evenings) held by the OUBS in Germany. Click here for events in Berlin. In Austria (Vienna) there is also an OUBS office with representatives. The Viennese OUBS Office offers course advice and holds regular Information evenings for prospective students. In "OUBS Regions Open Events Information" you will find an overview of the dates for the all forthcoming Open Events (Information Evenings) held by the OUBS in Austria. The Swiss OUBS is located in Geneva. The OUBS office in Geneva offers course advice and holds regular Information evenings for prospective students from Switzerland. In the document "OUBS Regions Open Events Information" you will find an overview of the dates for the all forthcoming Open Events (Information Evenings) held by the OUBS in Switzerland. The Open University is also represented in Belgium, France, Greece, Italy Luxembourg, the Netherlands, Portugal and Spain. Please click here for contact information and dates of OU events. In the document "OUBS Regions Open Events Information" you will find an overview of the dates for the all forthcoming Open Events (Information Evenings) held by the OUBS in various European countries. The reservation of courses at the Open University is free. You can also reserve courses online. Within a few days you receive a Reservation Letter. This letter acknowledges your reservation and contains the Registration Agreement. The brochure "How to of Accept Registration" explains the different payment methods: by student budget account, by cheque, credit card, invoice to sponsor or bank transfer. Information about "Computing Requirements" are also included stating the Recommended Minimum Specifications. After the Open University has received your registration documents, you will receive you very helpful OU course preparation material. The MBA Handbook (which is included free-of charge) contains advice about time management, exercises for effective learning, group work and tips for writing assignments and for preparing for examinations. The preparation for Computer Conferencing is extremely important. A prerequisite is TCP/IP Internet Access through a provider. Furthermore there is a training program (Induction) that has three aims. 1. that you can log in on the central server, and so that if necessary technical problems can be fixed prior to the start of the course. 2. that you are familiar with the FirstClass Conferencing software, and that you can use the key functions and features of the software. 3. that you feel comfortable with participating in computer conferences. The conventions, traps, possibilities and problems of "Computer Conferencing" are introduced. You must have good computer skills in Word 97 and Excel 97. Since the Word Wide Web is used as a supplementary source of information, you should be familiar with browsers such as Netscape or Internet Explorer. contains information about PPP, Netscape Navigator Installation for Windows 95/98, modem setup, connnection instructions and trouble shooting. contains information about using Netscape, making changes to your browser, newsgroups and other Internet Tools. - organizations and how to of trace them. This magazine is published every two months for the Open University Community worldwide and contains general news about the University. This magazine contains reviews for MBA Alumni of the Open University Business School. it contains an important overview with information about when, where and which tutor, and locations where tutorials are held for the courses. Also contained in this booklet is information about "Support for Study" and "Advice and Guidance". this is a letter from the Open University which informs you about the contact details of your tutor. Normally within a short time this is followed by a letter from the Tutor in which he introduces himself to you. that is the most important component of each course. In the Course File everything contained is of importance. In the "Course Calender" are all important deadlines for handing in TMAs and time recommendations for reading and working through each of the individual course units. The"Course Guide" contains an overview of the topics covered in the course. Contained in the Course file are also the questions for the Tutor Marked Assignments, Specimen Examination papers, Residential School Booklets, Day School Booklets and Media Notes. if you have enrolled in an OU course for the first time, it is important for you to discover which learning material b>(core course material) you must work through; and which material is additional (supplementary material), because the time pressure is always great while you are already planning or writing your next Tutor-Marked Assignment. The Course Books are compulsory literature. With the Course reader and the Supplementary Books you can be selective about which articles you read and sometimes you can go through the course without watching the video programs or listening to the audio cassettes. The Course Books are enhanced in FirstClass with discussion forums. There you can place your questions about applied theories and concepts which can then be answered by tutors, professors or other students. an important constituent of almost every course is the residential school. It lasts depending upon course between 3 - 5 days. For the course "Foundations in senior management" there are, for example, various workshops, case studies that you work on in a group, a computer simulation game and exercises for the forthcoming examination. Apart from that you become acquainted with that many nice study colleagues and you also have a lot of fun. The Residential Schools for the MBA courses take place in the United Kingdom, Ireland or Holland ; I attended residential Schools in Windsor (Beaumont), Dublin (Trinity College) and Leiden (Leeuwenhorst). Board and accommodation are included in the course fees. You have make your own travel arrangements and pay for your travel expenses. the biggest problem for a distance-learning student is the lack of time, the combination of full-time job and MBA - it is allegedly also the most common cause why people do not finish the course. For the MBA you must set aside at least 12-15 hours study-time weekly. It is therefore very useful to have a strategy for finding this required time; e.g. in that you could spend less time on your hobbies, or at work, that you cut down on the number of overtime hours that you work. 1. Sponsorship - at present over 4000 companies sponsor their employees on Open University courses. Therefore it may be woth talking to your employer about sponsorship. this course has been designed for very successful graduates of the Berufsakademien. The Berufsakademie Stuttgart and the internationally accredited Open University Business School (OUBS) and VMI member firms that have subsidiaries abroad. In this way the companies receive leaders for international projects. 3. Student loan - apart from the possibility to pay the course fees prior to the beginning of course, you can finance your course fees through a loan from the Open University. The open University offers cheap conditions (interest rate 8,5% per annum, status 1999) through the Open University Student Budget Account (OUSBA). For example, you can pay for a 6 month course in five monthly installments. If you are neither sponsored by your employer nor participating in a partner programme as mentioned above. If you say that your postgraduate degree is a consequential response to the ever increasing demands of skills of employees that industry requires of them, which in the future will guarantee and increase the income from your job. With this argument I had my study expenditures accepted by the Karlsruhe tax office as Werbungskosten abzugsfähige Fortbildungskosten. In my case there was a lot of correspondence with the tax office, which was finally resolved by a confirmation letter by my employer that the tax office Karlsruhe required, which stated that the purpose of the course enabled me to enhance existing and learn new skills and competences for my job. After all, you have to continously develop your skills in order to keep up with the demands of your job. This applies also to many jobs in various industry sectors. You have to decide for yourself whether your English is sufficiently good enough before you start an Open University course. Compared to some other business schools GMAT or TOEFL are not a precondition. Ideally you should read through sample course materials and check whether your English is good enough to understand the contents. (Comment 2018: In today's digital age you can easily access study materials online. On the digital learning platform Openlearn, which was founded by the Open University in year 2006, you can access and read free course materials from a wide range of subjects. Click here for a sample. The subjects (B800) Foundations in Senior Management and (B820) Strategy are compulsory subjects. In addition you have to take three electives, such as for example, B822 Creativity, Innovation and Change and (B821) Financial Strategy, and (B890) International Enterprise. "Als Anbieter beruflicher Qualifikationskurse nimmt Milton Keynes mit seiner Business School (OUBS) inzwischen europaweit die Spitzenrolle ein. Gut ein Viertel der 22 000 Studenten strebt den MBA-Abschluß an." (Süddeutsche Zeitung 2/3 Mai 1998). if you have enrolled in an Open University course, you automatically becomes a member of the Open University Students Association, which, for example, publishes the magazine "OU Student" and supports students in student matters. The OUSA is is also regionally represented, e.g. in Frankfurt. There is also a newsletter that the Frankfurt OUSA branch publishes on a regular basis and a "Stammtisch" which takes place once a month in Frankfurt. Taking care of all OU student in Germany is the Regional Centre for Continental Western Europe in Newcastle upon Tyne, which regularly publishes the "Newsletter for Students in Germany". Both the Regional Centre and the OUSA can be contacted online (discussion forums). With the OUSA Student Card you get discounts on theatre-, cinema-, flight-tickets and other discounts. both Bachelor and Master degrees awarded by the Open University are recognized in Germany. The legal basis for carrying the title "MBA (Open University)" in Baden-Württemberg can be read in the "Amtsblatt für Wissenschaft, Forschung und Kunst", ISSN 1434-5390, 18. Jahrgang, Stuttgart 31. August 1999, Nr. 8, Seiten 287, 325 und 327 in the section "Bekanntmachung über allgemeine Genehmigung zur Führung ausländischer Hochschulgrade". A copy of this official document can be found, for example, in the Badische Landesbibliothek Karlsruhe. BA-Studium international anerkannt: Akkreditierung der Berufsakademien bei der Open University, London, trägt zur internationalen Anerkennung des Studiums bei. The efmd (European Foundation for Management Development) in Brussels has been evaluating the quality of MBA schools. Under the name EQUIS a commission of representatives from economics, teachings and national institutions evaluate MBA programmes according to a very strict, differentiated system. Only 53 programmes have been awarded this accreditation, among them the Open University Business School. Further information about EQUIS and the list of the 53 accredited business schools can be found on the EFMD Web Site. In the United Kingdom management education has a long tradition. The Association of MBAs (AMBA) accredits programmes in the UK according to strict rules and quality features. The MBA program the Open University Business School is accredited by AMBA. Gives an overview of the courses you are currently enrolled in, personal data and previously completed courses and qualifications. This page is for MBA alumni of the Open University Business School - here you will find information about Alumni services, the Online MBA directory, meetings and interesting links. Here you can access directly your personal First Class account, read or write emails or participate in the discussion forums. Here you will find free software downloads and IT support. Here, for example, you will find links to the Open University Students Association (OUSA), press releases and the regularily published magazines Sesame and Open Eye. If you are waiting for the shipment of your course material, you can check here the status of the despatch for the respective courses. Here you find detailed information about Residential Schools and their locations - for many OU courses the attendence of the Residential School is compulsory. Here you can log into the library - particularly useful if you are researching a particular subject. Staufenbiel - Das MBA-Studium. Mit ausführlichen Porträts der besten Business Schools der Welt. This book introduces 80 internationally accredited European and American business schools and their programmmes in detail. Among them the programmme of the Open University Business School MBA. These are considered as the world-wide best. Detailed tables enable comparisons between the programmes. In addition another 70 programmes are briefly introduced. The book contains all necessary information around the MBA study and is helpful in searching and selecting a suitable programme. The MBA-GUIDE 2002 - Teilzeit- und Vollzeitprogramme zum Master of Business Administration from the Luchterhand Verlag. The MBA-Guide gives a systematic overview of the MBA-market and describes country-specific different types of programmes. It also examines critically the background the attraction of MBA-Programmes an gives useful tips and that help in the decision of choosing the appropriate MBA-Programme. This Study Guide has a special focus on Distance-Learning and Part-Time Programmes for people in employment. In this book I have written an article on page 132 about the OUBS MBA course. The study guide Online studieren - Fernstudium und virtuelle Universität from the publisher Lexika Verlag. This study guide contains information around the subject of distance learning. From the history of distance-learning to the use of most modern technology in learning and teaching, this guide contains a lot of useful information, many tips, ideas and examples. In the section Erfahrungen eines MBA-Studenten an der Open University Business School (Pages 69-73) you can read about my experiences with the distance-learning course. The Bundesministerium für Bildung und Forschung has published the study Praxisnah und international - der MBA in Deutschland in June 2001. The summary of this BMBF study including the results from a survey with universities, business schools, students, alumni and companies on the subject of Master of Business Administration (MBA) is available in form of a .pdf brochure (1,2 MB). Many current students, alumi and staff of the Open University as well as people interested in distance-learning have contributed through their questions and comments to the contents of this page. 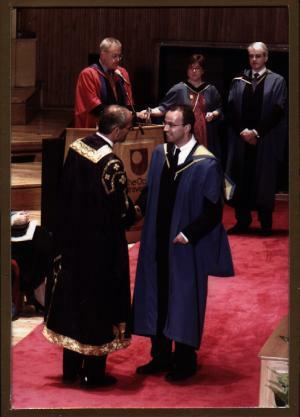 Finally two pictures from the Open University Graduation Ceremony on June 9th 2001 in the Royal Festival Hall in London.